Since I can’t fit every scrumptious ingredient into the name of this recipe without making it two pages long, let’s start with that: tender roasted eggplant, melty gouda everywhere, the prettiest oven-caramelized red onions, fig jam for extra sweetness, and brown rice tortillas fried golden in butter. Wait, is that five ingredients? You betcha it is. Okay, I count butter (plus olive oil, salt, and pepper) as a freebie pantry staple. I guess we’ll have to call this five ingredient Friday! If you have an extra 15 minutes, though, make the sun dried tomato and roasted garlic salsa. Even though you may accuse me of just making a no-cook marinara, I like to call it salsa and serve it cold as a tangy complement to the sweet and salty flavors of the ‘dilla. That’s short for quesadilla, just so we’re on the same page. I have a very love-hate relationship with quesadillas. We used to get along fine when I made them on the George Foreman grill–slap as many fillings as possible, not limited to a Mexican theme, between two little corn tortillas and throw it on the George. I always had this weird maneuver I used to flip it over with a fork, but it worked like magic with minimal filling spillage. Just to sidetrack, I’ve seen my Dad, in his carb-eating days, throw together some ridiculous towering creations in that little kitchen appliance. Oh, don’t mind me, I’m just going to cook up this three layer, six inch tall leftover meatloaf grilled cheese sandwich with every condiment in the fridge–it was leftovers on the best steroids available, but back to the matter at hand. I still own the G.F., which you could easily use for this recipe, but it’s buried under three sizes of cupcake pans, a water pitcher, a nearly-life-sized guitar-shaped cheeseboard, and a banana hook thing in my abyss of a corner cabinet (P.S., what builder doesn’t put shelves in a 2 1/2 foot tall cabinet?). That, and I feel that making quesadillas on a real pan is a necessary life skill. Perhaps they teach you this in culinary school, but I’m the worst at any food that requires the stovetop flip, and that’s where the fun usually ends. While they always taste good, I’ve served some downright ugly, mangled quesadilla bowls when a flip died midair, my spatula wasn’t big enough, or I tried for grill marks on an UNGREASED cast iron grill pan. I don’t enjoy scraping bits of tortilla off burning hot cast iron. It appears those days are over, though. The good news is, by using a larger tortilla and folding it in half as the top and bottom layer of the quesadilla, I can roll/hinge it along the fold without trying to get it to take flight (some of you are looking at me right now like, “duh”). The bad news is that I’ve eaten two of these already this week, possibly more by the time you’re reading this–not exactly health food. I’m not going to think about the total amount of butter and cheese that equals. Steve was away for work this week, and this quesadilla, or any quesadilla, is an awesome dinner for one. After several very long days of writing, cooking, and photography, even I want something that barely qualifies as “cooking” dinner. With the ingredients ready and the salsa made, dinner was done in about ten minutes from start to finish. 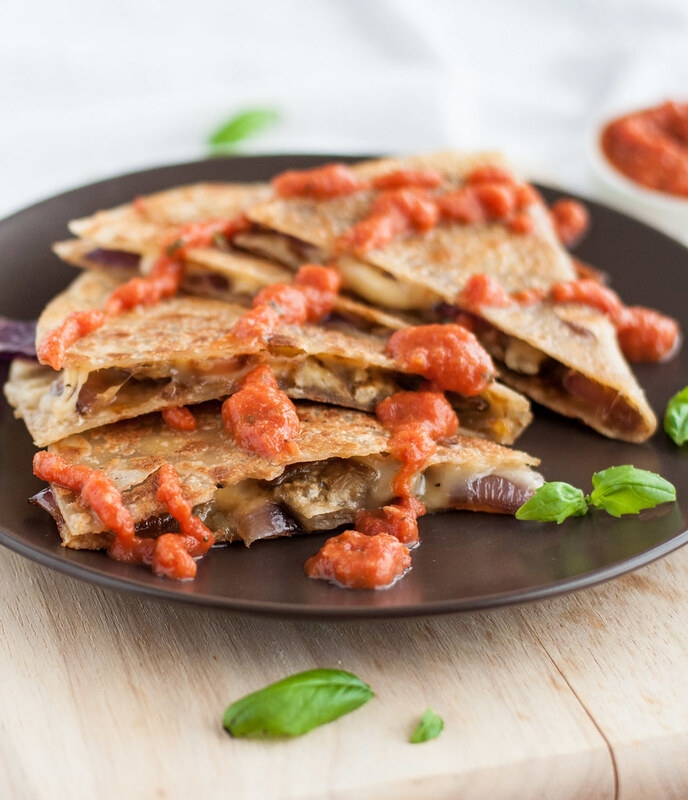 If you’re making more than one, keep the finished quesadillas warm in a 175 degree oven so everyone can eat at the same time. Or so you can eat all three at the same time. Before I moved to the east coast and started consuming cheese plates and wine at an incredible rate, I wasn’t really familiar with fig jam. If you’re in that boat, do me a favor and promise not to substitute grape jelly. Unless you do and it works, in which case I want to hear about it. Fig jam is often available at grocers with a big specialty cheese section, because they know how good it is to swipe a dab of that stuff on a bite of manchego. 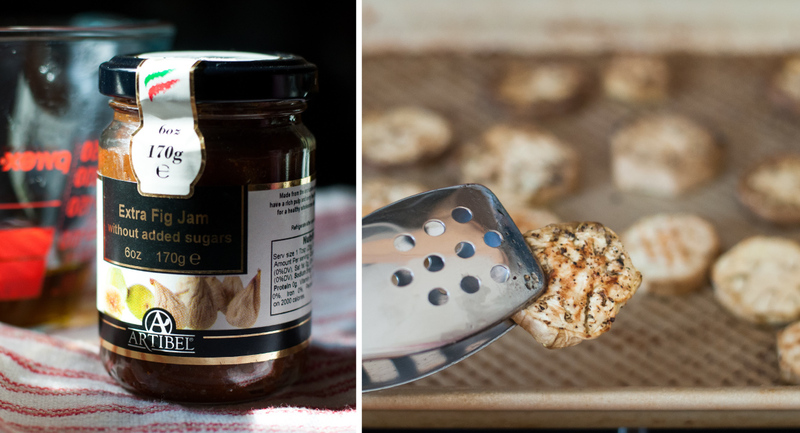 It may be found with the jams/jellies at some grocery stores, and, if not, try your local specialty foods store, cheese shop, or a Williams Sonoma. You might be surprised where there’s a cheese shop hiding in your town. Figs are one of those select produce items that you really cannot get unless they’re in season (I’ve gone on that wild goose chase before), but using the jam will allow you to make these seasonless ‘dillas whenever your heart desires. You also don’t have to get around any texture issues with the whole figs or pay an arm and a leg for them, and the sugars in the jam help hold everything together when spread all over the inside of the tortilla. Moral of the story: get the fig jam. You’ll be glad you did. Speaking of figs, maybe it’s no coincidence that this recipe was inspired by my lunch at Figs Wood Fired Bistro just last weekend. That’s right, it was so good, I couldn’t wait four days to recreate it. It did, after all, fuel three hours of posing for engagement photos in the rain. The restaurant version, with pan caramelized onions, was heavy on the fig jam (go figure) and a bit sweet for my taste, so the quantities and oven roasted onions in my recreation mellow out the sweetness factor. The flour tortilla they used was heavy and overpowered some of the great flavors in the quesadilla, so whether you’re gluten-free or not, I’d highly recommend using brown rice tortillas here. When heated and fried, they’re durable and brown up nicely in the butter, just as they’re supposed to. Spicy mayo is always a good idea, but when served at Figs with this quesadilla, it was a little too much rich dairy going on with the gouda. Okay, so it’s not always a good idea. The sun dried tomato and roasted garlic salsa, however, adds a hint of spice from crushed red pepper in a much lighter tomato-based dipping sauce. In between having an old friend in town today and some engagement celebrating this weekend, I’ll continue to stuff my face with these quesadillas until I run out of our Costco-sized block of gouda. I’m sure these will be a hit for both the men and women folk during some weekend football or whatever the weekend brings your way. Hope it’s a good one! 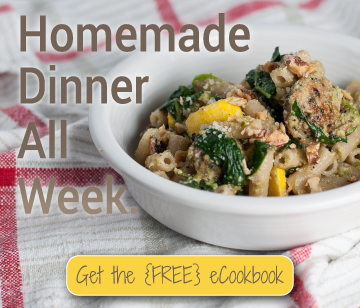 “See” you Monday with a dinner plan, as usual! Find the salsa recipe here, plus more in-process cooking shots on my flickr. Inspired by Figs Wood Fired Bistro in Sandy Hook, CT, I had to recreate this salty sweet Italian-Mex 5-ingredient wonder. Despite my usual distaste for sweetness in savory dishes, I can't get enough of this combination. Preheat oven to 400 degrees (F). Lay eggplant slices in a single layer on a baking sheet and spray (or lightly brush) with olive oil. Sprinkle with salt and pepper. 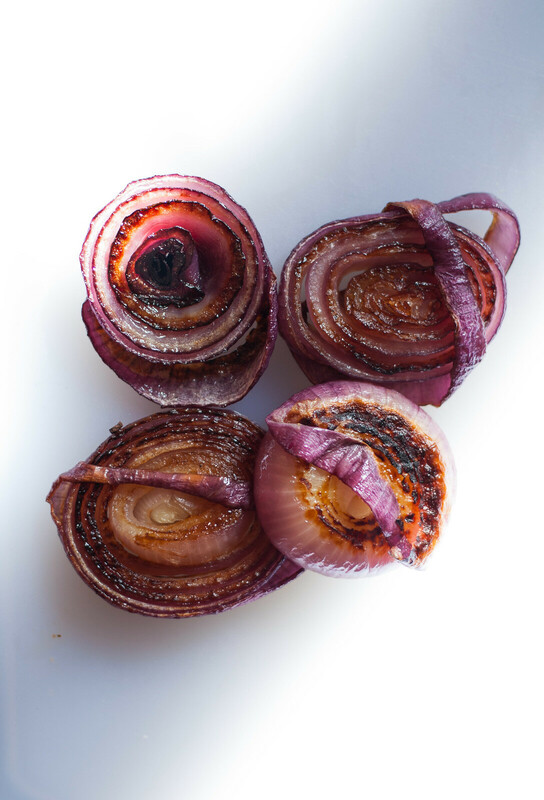 Slice the onion into 4 thick rounds, lay in a single layer on the same sheet, and lightly coat both sides with olive oil. If making sun dried tomato salsa, remove the loose outer sheath from a head of garlic, then cut the top off so all the cloves are just exposed. Place head on a sheet of foil, rub cut cloves with a teaspoon or two of oil, then wrap tightly in the foil and place on the baking sheet. Place sheet with eggplant, onion, and garlic in the bottom third of oven and bake for 10 minutes. Remove tray and flip eggplant slices over, then return to oven for 15 minutes. Remove tray and place eggplant in a dish to cool, carefully flip onion rounds over, and return tray to oven, turning 180 degrees, so the front side is now in back. Roast another 15 to 20 minutes, removing before onions are blackened (they will be quite dark, though) and when cut garlic cloves are golden. Coarsely chop eggplant slices (1/2 to 1” pieces). When onion cools, cut three of the rounds in half, reserving the fourth for the salsa, if making. 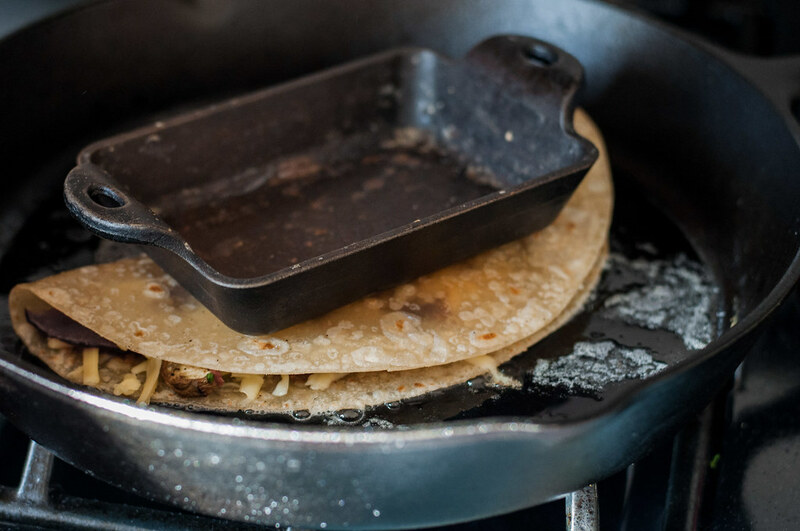 To make the quesadilla, melt ½ T butter in a skillet (preferably cast iron) over medium heat. When sizzling, add the first tortilla and cook about 45 seconds per side, until warm and pliable. Remove and let rest on a paper towel for a few seconds per side, to absorb excess butter. Repeat with the second tortilla (there should be enough butter left in the pan). Turn off heat. Lay each tortilla flat and use the back of a spoon to spread half the fig jam all over each one. Cover half of each tortilla with cheese, using up half of all the cheese. 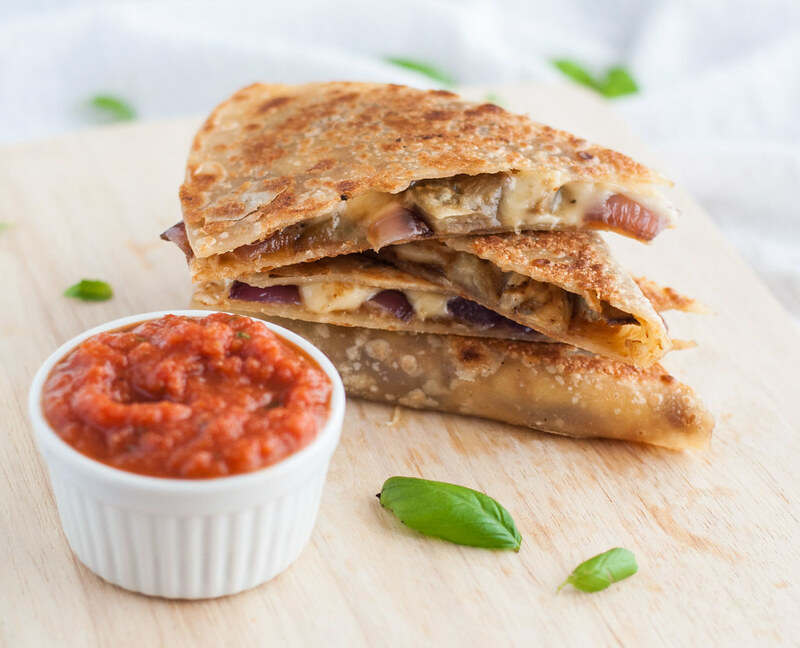 Layer onion strips and eggplant pieces evenly over cheese, then cover with remaining cheese. Fold the uncovered half of each tortilla over the fillings. Cook each quesadilla individually by melting ½ T butter in the pan over medium or medium high (depending on the strength of your stove). Gently lay quesadilla in butter and cook for about 2 minutes, until first side is golden brown. 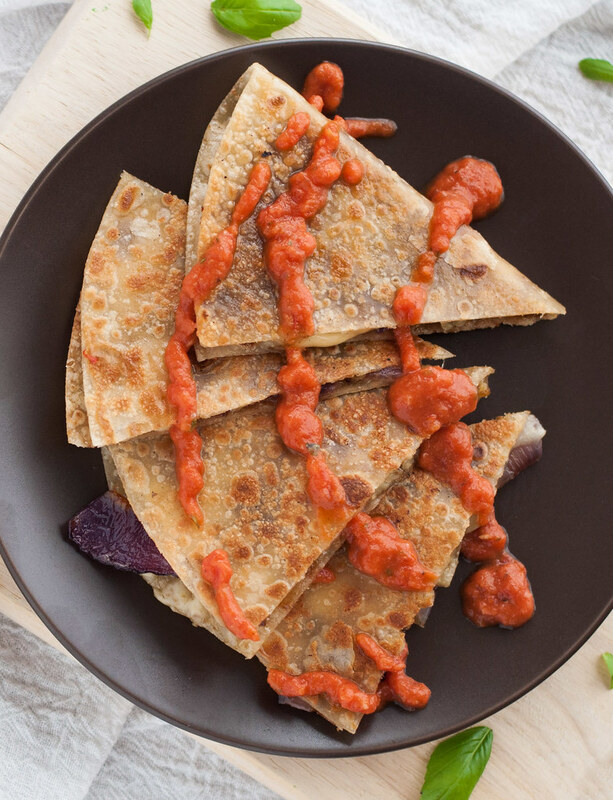 If you have another small cast iron pan or sandwich press, set it on the quesadilla as it cooks. 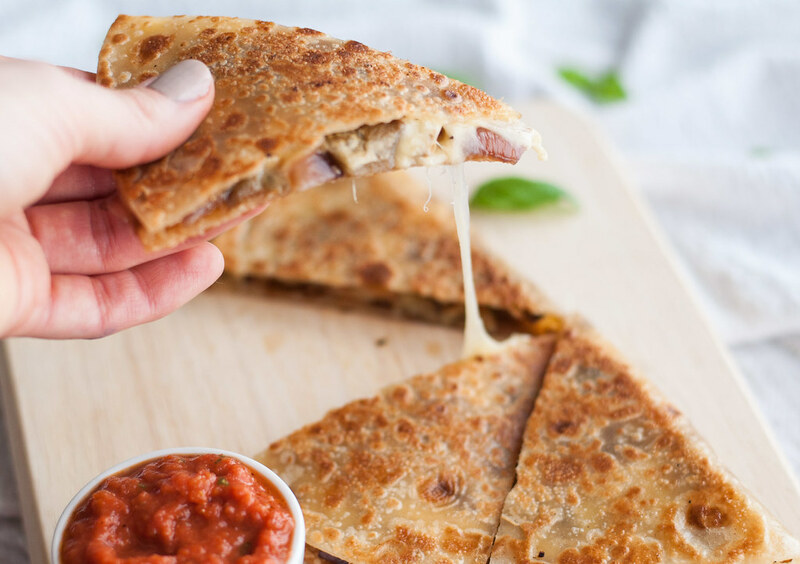 Flip quesadilla over along the fold, so the filling doesn’t fall out, then cook another two minutes until browned on the second side and cheese is melted. Cook second quesadilla the same way. If making more than two, keep finished quesadillas warm in a low oven. Cut into pieces with a sharp knife after cooling for a few minutes (extremely hot cheese will be a mess! ), and serve with sun dried tomato and roasted garlic salsa. Preparing and roasting the vegetables takes about 50 minutes. If done in advance and refrigerated, the total time is less than a half hour (much less, if you work efficiently). This looks so nice! It’s perfect for a chilly day.